It’s time for a giveaway. 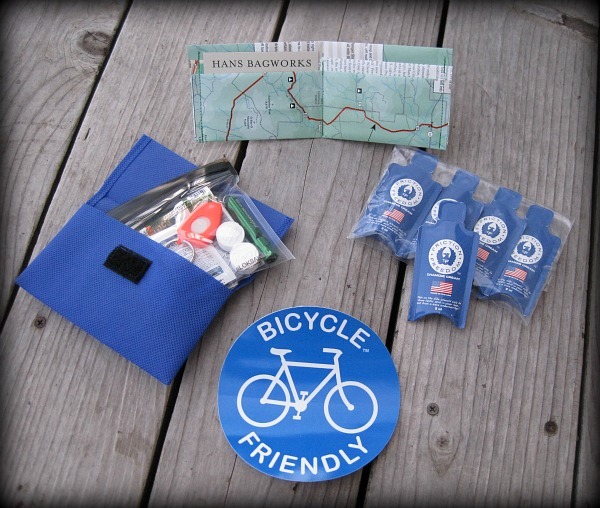 What better way to be prepared for your rides than a free GetOutThere kit! Plus, there are other items included in the giveaway. The winner will be announced on May 31st. Thanks to Scott Thigpen at Driven 2 Divide for helping out with the giveaway. Check out his blog for some fun product reviews and his preparation towards a Tour Divide start. He has posted a review of the GetOutThere kit and has included a little humor. It’s not easy to make first aid and survival products interesting or funny. A GetOutThere kit to keep you prepared and safe on your rides. 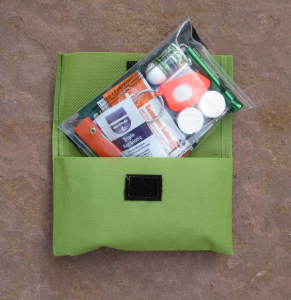 The kit contains first aid, emergency, and personal care items in a waterproof ALOKSAK bag and is small enough to fit in your jersey pocket. Hans Bagworks wallet made from Great Divide Mountain Bike Route maps. This is a nice little wallet that carries just enough cash and cards for rides or even a multi day trip. 5 pack of Friction Freedom chamois cream to protect your taint. Exceptional US made chamois cream. 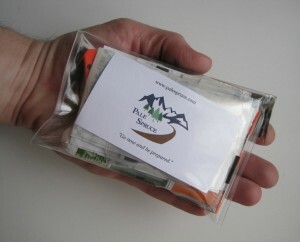 Easy to use packets are ideal for bikepacking trips. Bicycle Friendly sticker to show your support of cyclists. Each of the options below will get you entered to win. Do all three to triple your chances. A random number will be selected using Random.org to select the winner on May 31st. Simple comment – Submit a comment on this blog post. Mention your favorite trail if you want, but any comment will do. Be a Liker (not a lurker though) – Head over to Facebook, ‘like’ Pale Spruce and share this post or leave a comment on the Pale Spruce page. Be Twitter-iffic – Follow @palespruce and re-tweet the giveaway tweet or simply mention @palespruce and the giveaway in one of your tweets. Go ahead, let your friends know about the giveaway. Come on, don’t be a jerk and leave them out to increase your odds. That might make them sad, and we don’t need sad friends. Also, Don’t miss the clearance items still available with all proceeds going to NUMB to support the fight against hunger. The giveaway is closed and the winner is Billy via a blog comment. Congrats Billy and thanks to everyone that entered. A little bit nutty in general, a lotta bit nutty about bikes. Each of his boys received a bike helmet for their first birthday and the three of them have been biking together ever since. We like the trails around Red Rocks. Easy enough for the whole family, close to home and generally gorgeous. Red Rocks is a great place to ride. Apex Park is still my Front Range favorite. So a Get Out There Kit would be great! And I love this page too. My favorite trails are all of the trails snaking through Johnson County, Kansas. Nathan, yeah that Scott guy is trouble. Good thing he is a thousand miles away so he doesn’t bother me all of the time. What a great idea and I love to hike and bike so this would be very useful. I already have a Bike Friendly Sticker on my mailbox….a GetoutThere kit would be great as well!! thanks for the chance to win! my favorite trails are on my home turf at Oak Mountain State Park outside of Birmingham, AL! Have You Ever Been Chased By A Turkey? Little Green Singlespeed. Oh, The Places You Will Go!